Transition and Retirement (T&R) work continues at Kennedy Space Center (KSC) for Atlantis and Endeavour in the Orbiter Processing Facility (OPF), even as the Shuttle team said their goodbyes to Discovery last week. The NASA and United Space Alliance (USA) team is finishing up end-state safing activities on Atlantis, which is in OPF Bay 1, and Endeavour, which is in OPF Bay 2. Discovery’s ferry flight captured both the media and public’s attention, as the fleet leader took to the air one final time, on the back of the Shuttle Carrier Aircraft (SCA). With KSC now down to two orbiters, preparations are continuing on the next orbiter to leave, Endeavour. Also known as Orbiter Vehicle 105 (OV-105), Endeavour will be mirroring Discovery’s final depature, except this time the duo will be heading west to California. “Right now…what we’re working on is the TVC (Thrust Vector Control) actuators for 105,” Greg Olive, Senior Aerospace Technician for USA, said in an interview with NASASpaceflight.com earlier this month. In addition to the safing work, Mr Olive – who participated in operations to mate Discovery to the Shuttle Carrier Aircraft (SCA) for her trip to Washington, D.C – noted Endeavour’s OMS pods, LP03 and RP04, were re-attached on March 20th and March 28th, respectively, and the ship’s external airlock was removed from the forward end of the payload bay on April 19. Along with the work on the orbiters in the OPF bays, decommissioning work on the facilities themselves is also in progress. 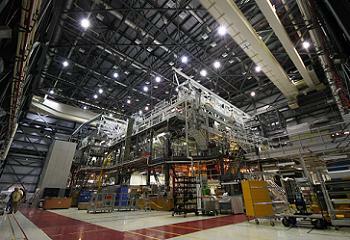 Hypergolic fuel and oxidizer safing operations have been on-going in both OPF-1 and OPF-2 in March and April. Endeavour will be flown piggyback on top of the SCA from KSC to Los Angeles International Airport (LAX), with at least one refueling stop on the way. Once Endeavour is demated from the SCA at LAX, she will be prepared for a parade from the airport through the streets of Los Angeles to her new home at the California Science Center in Exposition Park. 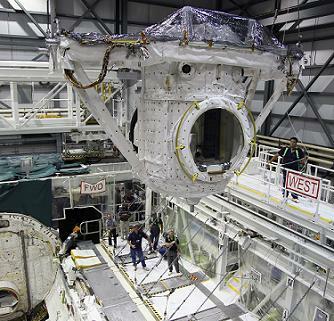 Meanwhile, Atlantis’ Reaction Control System (RCS) hardware, consisting of the FRC4 Forward RCS module and the LP04 and RP01 Orbital Maneuvering System (OMS), is still being decommissioned at a facility in White Sands, New Mexico. The hardware was shipped to White Sands at the beginning of March, where the tanks and plumbing are being removed from the structure. Bart Pannullo, NASA Vehicle Manager for Space Shuttle Transition and Retirement processing, said in an interview with NASASpaceflight.com noted they are tracking a mid-May return of the gutted structures to KSC, where they will be re-installed on Atlantis. Work on Atlantis includes one of the forward windows, window 3, being removed and replaced, as work also continues to prepare Atlantis for future museum display. Atlantis is currently scheduled to be towed in mid-November out of the OPF and down Kennedy Parkway to the Kennedy Space Center Visitor Complex, where work is also in progress to prepare the new facility where the orbiter will be displayed beginning sometime in 2013. There still remains the possibility that Atlantis will have to vacate OPF-1 for a new customer later in the summer and go back to the Vehicle Assembly Building (VAB) again. “(Atlantis) may have to go there for storage at the end, (but) we’re actually going to extend (Atlantis’ stay in OPF-1) one additional month – we’ve got that leverage,” added Mr Pannullo. 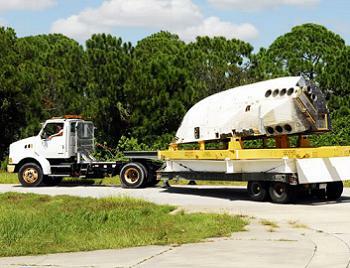 If Atlantis does have to go back to the VAB, “(we’re) tracking to end of July, first (part) of August for that. The team is also continuing to remove Main Propulsion System (MPS) components from the orbiters for possible future use by the Space Launch System (SLS) program, while they configure the vehicles for display in their future museum homes. “Right now we’re currently doing SLS hardware removals in the aft compartment of both vehicles – they’re kind of paralleling each other right now, (and) we’re finishing up the end safing,” Mr Pannullo noted. While those activities were going on, workers in OPF-1 were working to disconnect and remove some of the large MPS feedlines from Atlantis. Removal of the liquid hydrogen feedline for main engine number three was completed on April 11. The large, twelve-inch diameter feedline was supported by a trolley hoist system that helped workers move the section of cryogenic plumbing out of Atlantis through the 50-2 access door on the starboard side of the orbiter’s aft compartment (as seen in a series of images in a presentation acquired by L2 – Link). 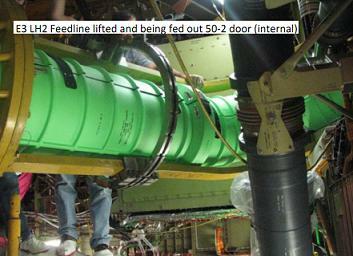 The companion liquid oxygen feedline for Engine 3 was removed on April 19.